The scenario is the following: There is a list of persons and places where those persons visit. Each person is connected to a single or multiple places. See the picture below, where O[i] represents objects (persons) and P[i] places, respectively. I need to get the list of places connected by those persons. Is this optimal way to solve the given problem for larger data? How can I estimate the computational complexity of those operations? Am I doing here something potentially dangerous or excessive with the collections? Any other concerns or remarks? This will make it reusable (and so testable). You ask "Am I doing here something potentially dangerous or excessive with the collections?". I'm not entirely sure what you mean... but I think no. Collections are efficient, and it's hard to do anything dangerous in C# by accident. If anything, you should probably be using more powerful collections. What is Tuple<string, List<string>>? What are Item1 and Item2? Give it a meaningful type, with meaningful member names! Never been much good at complexity... but here's an attempt at answering your second question. Take it with spoonful of salt. Hopefully someone will poke holes in it promptly. First you need to identify the parameters you care about. Let's say n for the number of people and 'b' number of places. You iterate over pairs of people, which gives you n^2 (just to enumerate the pairs). Inside that loop you are looking for an intersection between 2 sets of up to b elements, which can be no better than O(b) (that's the case where the hashes turn out perfectly, assuming Intersect converts one of the lists to a HashSet internally). cluster1.AddRange(cluster2.Where(x => !cluster1.Contains(x))) is O(b^2). You ought instead be using HashSets from the outset, which will get the inner working down to something more like O(b) again (i.e. HashSet<T>.UnionWith(HashSet<T>) is kind of just about linear most of the time). ... but then that matching can only happen n times... so it's a separate concern. Then there is the outer most loop... which I don't want to think about... but in the worst case it will be run n times, giving you a worst-case complexity of O(n*n*n*b + n*n*b*b), or just about O(n*n*n*b) if you use HashSets. I can't think how the space complexity of your code could be anything other than the input space complexity of O(b + n). Technically, your printing out at the end has third order time complexity: O(m*k*k) in number of clusters m, and number of places per cluster k. Consider using a StringBuilder or string.Join instead of Aggregate and repeated concatenation (that will make it O(m*k)). Any problem like this I would solve with disjoint sets, and even a poor implementation should get you O(n*b) time-complexity (max tree-depth is O(n)) on this problem. The basic idea is that you maintain a table pointers which describe a set of trees, each tree being an independent (disjoint) set. You can follow the pointers from any member of a set to the root member, and by assigning the parent of one root node to the root of another you join the two sets together. You can throw an implementation together in no time, with very little code. Some very unscientific benchmarking suggests that a somewhat untested disjoint sets implementation I just threw together is a couple of orders of magnitude faster than your implementation (using HashSets and with reduced Pair count, as suggested in Paparazzo's answer) on randomly generated problems. Your implementation is taking over 10seconds on my machine to solve a problem with b=4000, which the disjoint sets solve in a few milliseconds. The disjoint set version seems to be linear in n*b (easier to scale than just b in random problems); yours is taking a while for larger problems larger than n*b=5000, and I wouldn't wish to comment on the experimental time-complexity with these few (noisy) results. Note that a decent amount of this is preference but I do provide reasoning for it below (I try to encourage improved code readability). I would make bool proceed = false; into var proceed = false; to keep consistent with your usage of var. Booleans usually have a prefix of is, has, will, etc. So perhaps willProceed is more fitting. Ultimately, it might be best to name it something that describes the scenario in which we will proceed. In this case, I believe you proceed as long has you have found intersecting pairs/clusters. So maybe hasIntersectingPairs or hasIntersectingClusters it's not as short, but it definitely is more clear on its intentions. 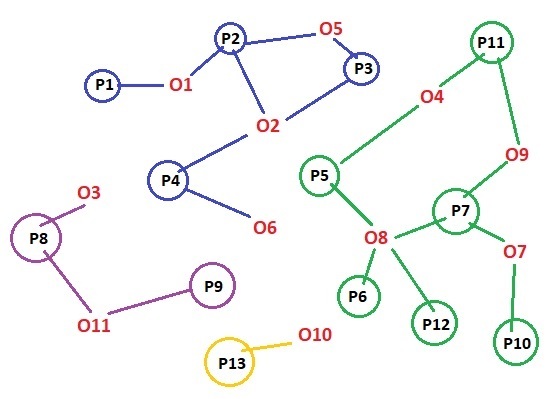 Typically you would make local variables such as Connections and Clusters lower-case (i.e. var connections = ...; and var clusters = ...;). I might be wrong, but I'm pretty sure your foreach statement can be replaced with LINQs FirstOrDefault and an if-statement. No need for a break and it's a bit more clear what the possible paths your program can take, since your foreach loop will either find an intersecting pair and stop (via break) or will find no intersecting pair and continue until out of pairs. Additionally naming it cluster (instead of pair) makes the naming line up with cluster1 -> cluster.Item1 and cluster2 -> cluster.Item2 without having to make unnecessary variables. If you prefer the extra variables I would then suggest you take VisualMelon's advice and make a meaningful type instead of using Tuple<>. Not sure it matters but you are creating all pairs. (A,B) and (B,A). If you only created unique combinations you would cut the count in 1/2. Not the answer you're looking for? Browse other questions tagged c# performance linq collections or ask your own question. Better ways to build a linq specification for querying or is this the only way?